Saint Patrick, legendary patron saint of Ireland, bravely returned to the Emerald Isle after escaping many hard years of slavery, to heed his divine calling to convert pagan Irish Celts to Christianity. Although St. Patrick wasn't the first Catholic missionary in Ireland, he is undeniably the most beloved. 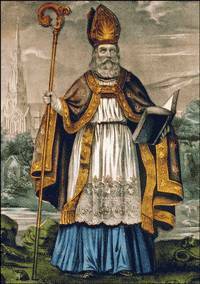 There is no doubt that St. Patrick is the most beloved of all the Irish Saints. Dozens of churches and cathedrals all over the world are named after him. What is written about the life of St. Patrick, like that of so many Irish heroes, is a mixture of both fact and fantasy. It is easy for the authentic history to be flavored with exciting myths. What is indisputable, though, is that he is the man who firmly established the Celtic Christian Church in Ireland, ushering in the "Age of Saints and Scholars" in the midst of the Dark Ages. Thanks to the leadership of Saint Patrick, Ireland went from being an isolated island with a population that was mostly illiterate...to a thriving culture of spiritual devotion and scholarly pursuits. One of the things that I find especially remarkable about Saint Patrick is that, rather than lead an oppressive conversion effort, he found ways to blend the old Celtic spiritual beliefs with Christian doctrine. The result was that the Irish people became one of the most devout group of Catholics on the planet! I found it very hard to sum up the life and legend of this amazing man in just one or two short pages. Instead I have a selection of fact, fantasy, and festivities for you to choose from. Celtic Christians have a wonderful role model for how to live a Christian life in Saint Patrick. He was blessed with an open mind and heart, which enabled him to hear God speaking to him in his dreams. His love of all that God had created was unmatched, except perhaps in Christ Himself. Alongside Saint Valentine and Saint Nicholas, Ireland's Saint Patrick is beloved by both religious and secular people the world over. To be given the title of Saint in the Roman Catholic Church is not a small honor. It often takes centuries of in-depth examination of one's life by the Church. To be a saint, one must have several confirmed visions and miracles attributed to them. Saints are models of holiness and sources of strength and encouragement for any believer on their spiritual journey. Saint Patrick, without a doubt, deserved that title. In fact, I dare say, the title was never given to anyone more deserving.